Footy is a game to break your heart sometimes. Unfortunately, Round 21 was the kind of round to remind you of that. With just a fortnight left to go there’s a number of teams who now find themselves at their lowest ebb, suffering from a complete lack of momentum at a time in the season where momentum is everything. Geelong were tested on the big stage for the second time in two weeks, and were once again found wanting – not by too big a margin, but losing is losing. Port Adelaide, having sworn to take the next step towards premiership contention, suffered a demoralising deja vu defeat, compounded by serious injury – Charlie Dixon done for the year, Paddy Ryder re-injuring his hip. GWS, though they continue to notch the wins, picked up four fresh injuries concerns to have headaches over, after finish last week so wounded as to be playing two men short in the final quarter. Collingwood got through a Saturday night win over the Brisbane Lions unscathed, but copped another blow at the lower levels as Ben Reid reinjured his hamstring. North Melbourne, after having all the results fall their way on Saturday, feebly failed to defend their finals chances against a Western Bulldogs side that had nothing but pride to play for. Melbourne burned chance after chance in a crucial encounter at the MCG against an opponent they arguably should beat, not that it comes close to earning a place in their top ten disappointing days of the decade. 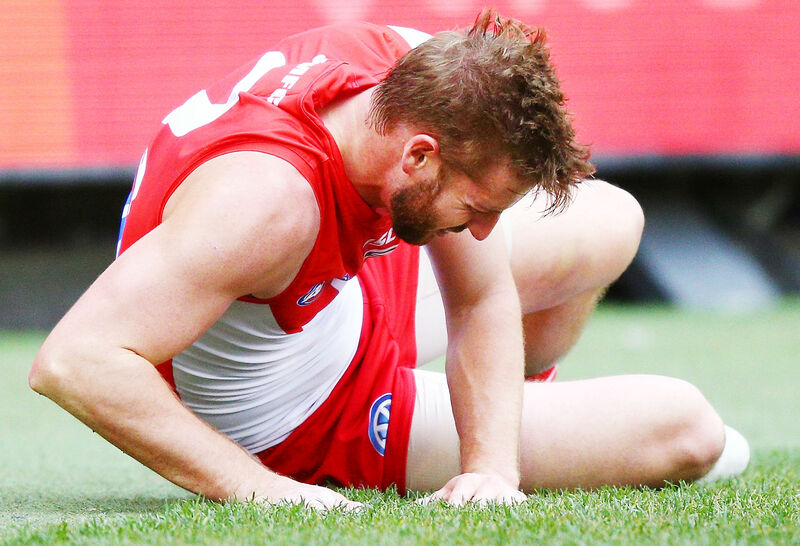 But the most gut-wrenching moment of Round 21 without a doubt was what unfortunately looks like another ACL injury to Sydney’s Alex Johnson, two games into his comeback from nearly six years on the sidelines. I’m an optimist most of the time, but won’t do Johnson and Sydney the disrespect of trying to pretend there’s a silver lining. Sometimes luck is bad, sometimes life is cruel. Of course, bad news for some sides can be good news for others – in particular, Richmond, whose odds to go back-to-back grow ever shorter, and Hawthorn, who look set to glide into a top-four finish. On one hand it’d be easy to say that Richmond’s premiership defence is reaching Stephen Bradbury levels of ludicrousness as would-be contenders fall over themselves in a race to, well, fall over. On the other one has to pay tribute to how their side has evolved this year – they were a dominant September side last time around, but a whole different beast in 2018. Dustin Martin and Alex Rance guided them to victory last year but it’d be fair to say neither is quite at the same level this year that they were last. Instead Jack Riewoldt has been the one playing like the marquee man. It may have been against a 17th-placed side, but his dominant performance this week put his season on the map in a way it really should have been a while ago. In 2018 not only is he averaging his most goals per game in six years, he’s also averaging his most inside 50s per game across the length of his entire career. Just imagine what life will be like with Tom J Lynch drawing away one of the oppositon’s best defenders for him next year (presumably) and giving him even more space to work in. Equalisation, yippee. 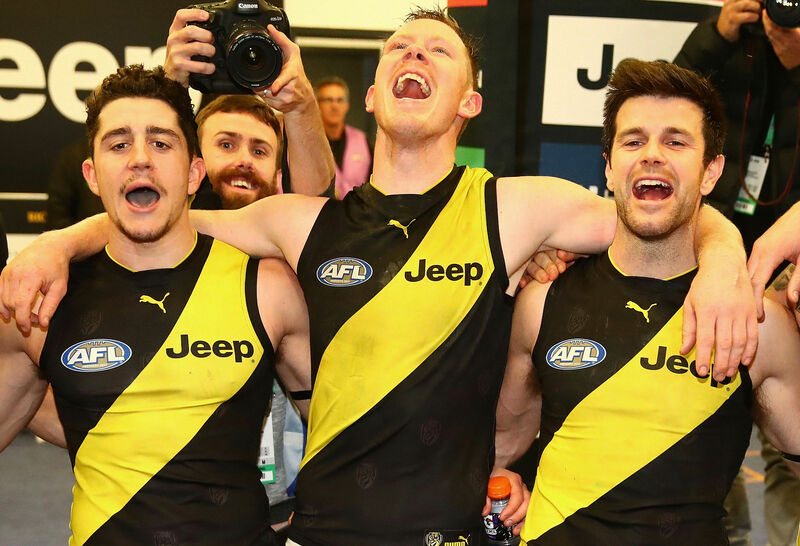 At the risk of putting the mozz on them – or perhaps intentionally trying to do so – the Tigers would have to bugger things up pretty badly from here not to be celebrating another flag in seven weeks’ time. As for the Hawks, their biggest asset is that sense of confidence that no doubts derives from the presence in their team of multi-premiership veterans, mentored by a multi-premiership coach. I tipped them to beat the Cats this week not because I think they’re the more talented team, but because I could rely on them having their heads screwed on for 120 minutes (and cannot do so for Geelong). A fun little fact for you is that despite having been in the competition together for 110 seasons, Richmond and Hawthorn have never played each other in a finals match – perhaps 2018 will finally be the year. West Coast and Sydney (Johnson’s injury aside) should both also be feeling pretty chipper with their results this week, though neither is out of the woods just yet – more on that later. With September on the horizon I’ve got my fingers tightly crossed that something is going to come along to change the season’s momentum and throw a few things back into flux. Maybe GWS or Collingwood can have some good news from the doctor just for once, maybe Geelong can realise they’ve got three all-time greats in the middle and play like it, maybe Josh J Kennedy or Lance Franklin can grab the season by the horns. Maybe – and if we can have any single favour from luck, let it be this – a miracle will happen and Alex Johnson’s injury will be something less than what it looked like. But if not, let those of us who are devastated by devastated, and let those who are joyous feel joy. Footy gives and takes away. Let’s hope the wheel is always turning. North Melbourne’s capitulation against the Western Bulldogs has made it all but certain that the ‘Roos will miss out on September, and leave us with nine teams genuinely left in the race for finals. Sure, you could make mathematical arguments for Essendon or North Melbourne to get in, but both would need a serious of events bordering on impossible to come together – it’s just not going to happen. Geelong are the team who find themselves on the outer right now, but with fixtures against Fremantle and Gold Coast are Kardinia to close out the year seem almost certain to bank two wins and put heavy pressure on those just above them. Hawthorn, Collingwood and Sydney all need to bank just one more win to make September certain. Hawthorn should do so next week against St Kilda, Collingwood in the final round against Fremantle (if not against Port Adelaide in Round 22), Sydney have it a bit tougher playing the Giants and Hawks to close out the year. Melbourne, too, probably only need to bank one more win – while they’re four points behind the Hawks et al, their mammoth percentage is almost worth another win it itself. A wounded West Coast next week presents a great opportunity, but they’ll be in dire straits if they blow it. 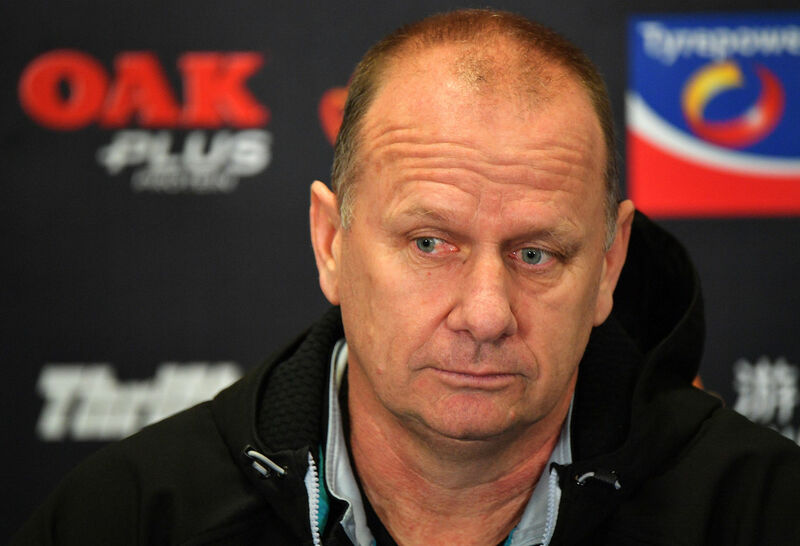 Port Adelaide probably look the most vulnerable – they really must win their last two if they’re going to stay ahead of the Cats, and with Collingwood and Essendon to come in the last fortnight, that looks far from certain. Where has early-season Jack Darling gone? 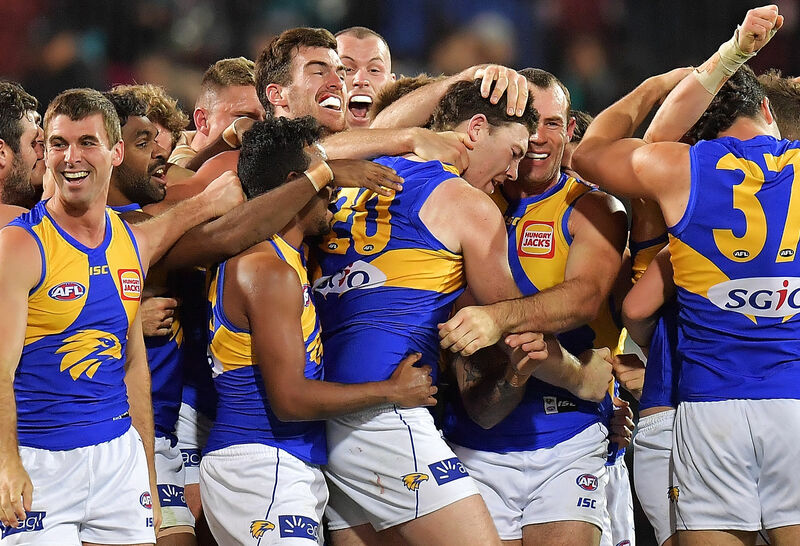 Let me take nothing away from what was a remarkably entertaining victory by the West Coast Eagles on Saturday – it was a brilliant game of footy as a spectator, and the four points must have fans feeling a lot better after navigating a tricky week off the field. However while the Eagles got the win, I’d say the manner in which they did so did little to convince me that they are going to be capable of winning a flag with the 22 they’re currently putting on the park. They desperately need one of two things to happen – either Josh J Kennedy comes back in and fires, or Jack Darling rediscovers the form that saw him dominate the competition earlier this year even with his partner-in-crime on the sidelines. On Saturday Darling could manage only four kicks and 0.1 on the scoreboard. Credit must be given to Port Adelaide’s defense, but West Coast need more from him if they’re going to be a serious September threat. The Jaeger O’Meara trade at the end of the 2016 was one of the most dramatic we’ve seen unfold, as the Hawks ultimately bent over backwards to seal an eleventh-hour deal with Gold Coast for a player who’d not been seen at AFL level in two years. Sceptics were not hard to find, and let’s be honest, no neutral fan would’ve been too sorry to see Hawthorn burned after having won three of the previous four premierships. Unfortunately for lovers of schadenfreude but fortunately for those who appreciate fine footballers, Jaeger’s 2018 season has made it clear he’s going to be a star player at Hawthorn for years to come, with a match-sealing goal on Saturday the exclamation point. He’s probably become more of an inside-leaning player than he was in his first two years in the comp, a bit like Chris Judd in his later Carlton years – but, also like Judd, he’s a damn fine one. If those judging the Rising Star Award in a few weeks time decide to look back on this week’s game as a guide on which of Jaidyn Stephenson or Alex Witherden to back, they’ll have a hard time deciding. Stephenson finish the night with 25 disposals (19 kicks), eight marks, five inside 50s and a pair of goals. Witherden had 30 touches (22 kicks), 11 marks, six rebound 50s and a goal assist. How to pick it? For mine, Stephenson has the star power, Witherden has more complete body of work – so it probably comes down to which of those you think is more important. I’d liken it to the close decision between Marcus Bontempelli and Lewis Taylor a few years back. Taylor had done more for the year, but everyone could tell Bont was going to be a bonafide superstar. That seemed like a close call then, and seems like anything but now. Will Stephenson vs Witherden wind up going the same way? Hard to say – both have bright futures. What does St Kilda need at the draft? St Kilda’s season is well and truly over – has been for probably about 19 weeks – and the offseason will be a crucial one. As I did last year, I’ll be breaking down every club’s list and previewing their trade and draft strategies once the home-and-away season ends, so keep an eye out for that. But it’s curious to think for now what kind of player they might look to be targetting when the 2018 draft rolls around. Sam Walsh would be an ideal recruit – their list could use more leadership young and old, and he will provide that. Unfortunately, he’s not going to be there. Izak Rankine would be my next pick for them – a dynamic excitement machine who can add some creativity and watchability to what is currently a fairly mashed-potatoes midfield. However the Saints may well wind up being in a position where it’s hard not to take one of the taller players on the board – likely a choice of Max or Ben King. Max has been rehabbing his ACL injury using the Saints facilities, so they’ll have more intel on him that any other club, but do they want another key forward? Ben might be the better choice, as they can mould him to be their defensive lynchpin rather than risk him pushing Bruce or McCartin out – but a dynamic midfielder should be No.1 on the shopping list.